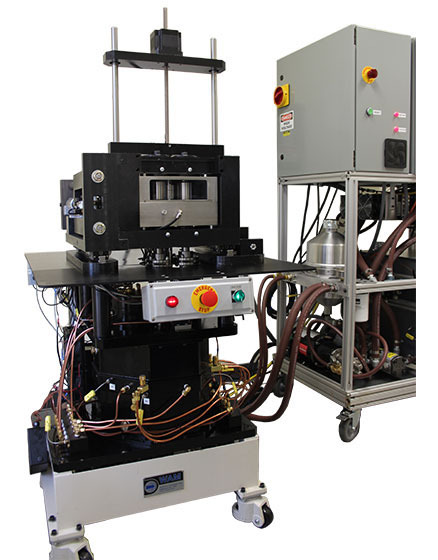 WAMmp - Micropitting Test Machine | Wedeven Associates, Inc.
WAMmp utilizes an advanced gearbox design and other support components to precisely control speeds of test components while measuring incipient sliding conditions on test articles under an applied load. It is intended to evaluate oil and material pairs for specific performance characteristics related to high cycle fatigue and micropitting. These test conditions are designed to represent the lubricated coatings found on the integral raceways of planetary gears. Rolling elements made from materials like M50 operate against case carburized gear steels under near pure-rolling conditions. Integral raceway spalling can be a critical failure mode for applications like helicopter transmissions.